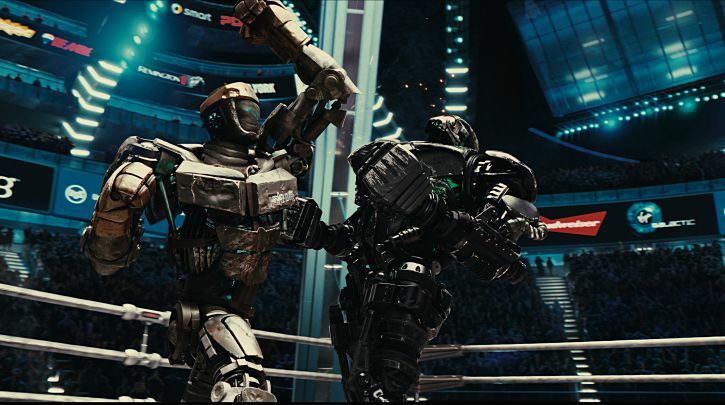 It is easy to dismiss "Real Steel" as a rock 'em sock 'em robot movie that is here to capitalize on the success of the "Transformers" films. I sure did, and up until rather late in the promotion campaign did I really have any desire to see the film. It was odd to think director Shawn Levy, who mostly worked in family films and comedies such as the "Night at the Museum" series and last years "Date Night" would be able to pull off a big budget action flick with tons of special effects and Hugh Jackman at its core. Strip away all that though and what we have is an inspiring father and son story that, while I admit has its cheesy parts, is exactly the kind of movie I would have loved when I was younger. Levy balances the tender bonding moments with the fight scenes rather well and I never cried boredom during the entire two hour run time. This is one of those films that if you see it as a 10 or 12 year old it becomes ingrained in your childhood memories and you forever relate to it as nostalgia. That I can so easily relate this to that kind of emotion not only makes me love the movie more than I ever thought I would, but it makes me appreciate that it was even made. So many films for younger audiences these days are either slanted too far to one side whether it be animated movies for youngsters or juvenile tween comedies only 13-17 year old's could stomach. 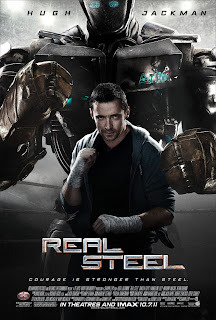 "Real Steel" is truly a movie for everyone and if you aren't cheering at the end, well, you really need to re-discover that kid you used to be, because they would have loved this. boxer "Noisy Boy" what to do in his next bout. Hugh Jackman has always proved an interesting actor to me. Outside of Wolverine I have never felt the guy really had a career. Though I loved him in Christopher Nolan's "The Prestige" as well as Darren Aronofsky's "The Fountain" I never viewed them as hits that the general public were able to access and take away from them a performance that allowed them to see Jackman outside his adamantium clawed persona. This, for me, is his first real commercial success outside of the "X-Men" franchise and I couldn't be happier for him, because he is clearly an uber-talented guy that just hasn't caught his break. For Jackman not to be defined by that comic role is critical to how he will be remembered and to know that he will now be a young audiences hero for other reasons is refreshing. Why am I drooling over Jackman? 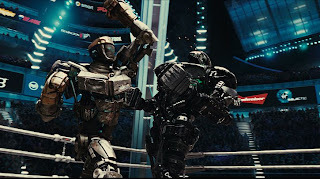 I'm not really, but if you have seen or plan on seeing "Real Steel" you will understand. He plays Charlie Kenton here, a washed up fighter who is now a bot jockey as the 2,000 pound, eight foot robots have taken over the sport he once held so dear. Traveling across America in a completely believable 2020 (kudos to the production designers for not over doing it) he makes stupid bets and takes fights his beat up bots can't win hoping to get himself out of debt, but only digging his hole deeper. Where we come in is naturally when things begin to change for our protagonist. Charlie is kind of a jerk, he's so desperate for cash that when he learns he has a son who he now has custody of he basically sells the kid to his rich sister-in-law. The catch is, uncle and auntie will be out of the country this summer and need someone to watch little Max. You can imagine where the kid ends up and the bond they form from there. during the course of "Real Steel". Yes, the story can be rather corny, but Levy, his team, and his actors seem so dedicated to making this an enjoyable and fun film that it seeps through the chessiness and we appreciate what we are being served. The movie really turns on not only Jackmans enlightened performance but just as much on that of young Dakota Goyo who plays Jackmans son, Max. He is a cute kid and the chemistry he and Jackman pull off on screen cements the believability of their trek through the back roads of America to the big time. The only qualm I really had with the kid was making him up with the Bieber cut and then having him dance as a gimmick with the robot behind him as they entered the ring. This was the cheesy extreme and though it was fun in its first improvisational moment, from that point on it only garnered unintentional laughs. What Levy does best here is pace the film at a perfect speed so that the relationship grows from self-centered, money grubbing dad and abandoned child to that of awkward roommates and from there through the trials of finding common ground and then addressing why they have reached the point the find themselves at in the films climax. That the movie can chronicle this relationship so well, and in a most genuine of Hollywood ways while mixing it with the back drop of fighting robots is what allowed the movie to rise above it's early labels I placed on it. Speaking of those fighting robots, they're pretty awesome. The flawlessness in which the humans interact with them and the rawness of them in the early scenes is visually dazzling. It made me feel like i was watching a summer movie in fall, in a really good way. In the main event, Atom beats up on the champion, Zeus. I held a good amount of doubt for "Real Steel" and in that regard, this may be the biggest surprise of the year for me. I had similar feelings about the MMA movie "Warrior" which also turned out to be a great movie. And while I wouldn't go on to think this holds near as much clout as that movie could have had it given a better box office showing, this is instead a big film with a lot of fun packed into it. This movie is the reason whole families still go out to see movies together and no matter how cliche the story might be or how dumb it may seem that robots could replace flesh and bone boxers in the future, it all seems rather credible once you reach the underdog fight between Charlie and Max's Atom and the undisputed world champion Zeus. There is also a sweet love story that develops between Jackman and Evangeline Lily's Bailey, the daughter of Jackmans trainer from his boxing days. Lily, who most will know from "Lost" adds a nice balance and voice of reason to Charlie's life and though this relationship is not the focus of the film, it comes off completely genuine and we care as much about Charlie and Bailey as we do Charlie and Max. This, mixed with grand tension, great action, and a story we've seen many times before told in an innovative way, you can't help but fall for its charms.